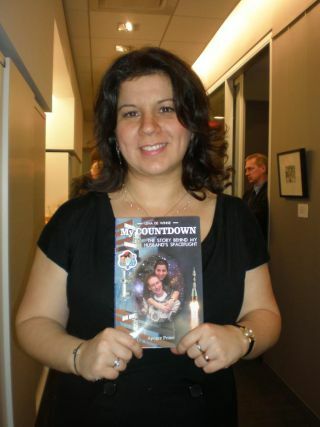 Lena De Winne, wife of Belgian astronaut Frank De Winne, poses with her new book, "My Countdown," at New York's Flanders House. NEW YORK — Clearly, being anastronaut requires courage, butastronauts' spouses must have a different kind of strength to watchtheir lovedones leave planet Earth – and families – behind. In her new book, Lena De Winne, wifeof European SpaceAgency astronaut Frank De Winne of Belgium, chronicles her husband'ssix-monthtrip to the InternationalSpace Station last year from the perspective of those left onthe ground. The book, called "My Countdown," waspublished inlate October by Apogee Prime. The title refers to Lena De Winne'scountdowntoward her husband's return, begun after therocket's liftoff. Bornand educated in Moscow, Lena De Winne has a master's degree inengineering and a doctorate in psychology. She has worked in support ofboth the Russian Mir space station and the International Space Station. Frank De Winne launchedinto space May 27, 2009 aboard the Russian Soyuz TMA-15spacecraft fromBaikonur Cosmodrome in Kazakhstan. When he took the helm of theoutpost'sExpedition 21 mission, he became the space station'sfirst European commander. Lena De Winne said she wanted toshowcase the side ofastronauts' lives that often gets left out of the picture. "People see astronauts like Hollywoodactors – ascelebrities first," she told SPACE.com. "And the truth is they arenot celebrities first — they are technical people and scientific peoplefirst. Theyhappen to be humans who contribute to the advancement of science andtechnology." But while having a spaceflyinghusband is certainlydifficult, it's the life she's chosen. "I don’t consider it a sacrifice interms of supportinghis work," Lena said. "I have a very peculiar life but I'm notcomplaining. I'm enjoying it." In "My Countdown," Lena De Winnechronicles someof the most difficult aspects of her husband's mission, such as thetrouble shehad with the Russian space agency officials trying to persuade her nottoattend her husband's launch and landing in person. Traditionally, theRussiansystem has been very male-dominated, with some believing that womenbring backluck to spaceflight. "The original Russian mentality doesnot have a lot of roomforfamily," De Winne said. "I have heard it seriously told to methat 'You should not go to the launch because it would then bring badluck toany vehicles, so do you want your husband to die if you insist to go tothe launch?'" De Winne wasn't dissuaded by theseremarks, and insisted onseeing her husband's launch and landing – no matter how peculiar mostof theRussian officials and even the Russian astronauts and their familiesthoughtit. Ultimately, she grew very close withthe wives of Frank'screwmates – Russiancosmonaut Roman Romanenko and Canadian astronaut Robert Thirsk, wholaunchedtogether on the Soyuz rocket. Romanenko's wife Yulia and Thirsk's wifeBrendabecame Lena De Winne's confidants and friends over the course of theirhusbands' space mission. "We truly feel that we must all havedone somethingright in our lives to deserve each other, because even though we liveindifferent continents — and Yulia and Brenda, they don't even have thesamelanguage between them — but somehow all three of us get on very well,"DeWinne said. The other two wives contributedstories to the book, as dideach of the Expedition 21 crewmembers. Russian cosmonaut Gennady Padalka,who served as thecommander of the previous Expedition 20 mission ( and overlapped withFrank DeWinne on the space station during the first half of his mission), saidthe bookshowcases a new side of spaceflight. "Through the prism of Lena's story, Isaw a totally newside of life of all our wives; their worries, their concerns, but mostimportantly their infinite love and care for us," Padalka wrote in aforeword to the book.